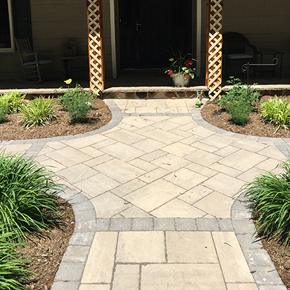 A new walkway will change the way that you use your landscaping and hardscaping features forever, beautify your yard, and make it much easier to get around safely. 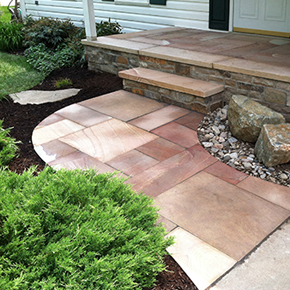 Carroll Landscaping offers expert walkway design, installation, and maintenance. Walkways are designed to prevent you and guests to your home from trampling through the grass, landscaping, or gardening when you are traveling to another destination. Since they add defined structure and safety to your landscape, they can be used throughout your property and in coordination with landscape lighting. Walkways are often combined with other hardscaping and landscaping features for an impressive yard. If you love enjoying your garden and plantings, adding a walkway through your winding garden or just near your flowerbeds will greatly increase your enjoyment of your landscaping plantings. Many homeowners add walkways to their yard to increase safety and prevent tripping over a tree root after a late night at the office. Landscape lighting is the perfect complement to walkways, as it helps to illuminate the footpath after dark. The entirety of your walkway can be lit, or select portions leading to and from doorways can be accented with beautiful landscape lighting. Do you have a pond in your backyard? Add a walkway gently wrapping around the boundaries and leading to your home so that you don’t need to damage the rest of your landscaping to enjoy the fish and flowers. Walkways surrounding ponds are a very common way to accent the border of the pond and increase the beauty of the water feature. Over our three decades of experience, we have perfected the walkway installation process. The walkway installation process beings with a design meeting to learn about your personal style, budget, and needs. Our award-winning landscape designers will create a detailed design for the walkway and map out the scope of the work. Next, we will work together to arrive at a final approved design that incorporates your feedback. Once the design and planning phase concludes, we move into the scheduling stage. Now that you have approved the final design for your walkway installation, we will procure the necessary materials and schedule a date. On installation day, our installation crew will show up on time with all of the necessary materials to complete any site work and prepare the area. When the site is properly prepared, we will begin the installation. On the final day, our workers will ensure that the walkway matches the original specifications, that the area is cleaned up, and that your yard is put back together properly. 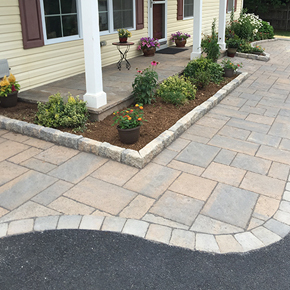 We always leave our clients with a ready-to-use finished project so you can show off your walkway at a patio dinner party or backyard barbecue. To learn more about our walkway installation process, click here.